Compiled and published by D.H.Lewis, this 90 page reference book was an "unofficial and unauthorised research volume for the purposes of criticism and review, and is in no way associated with or sponsored by the owners of the copyright in The Phantom character". It sold through newsagents and comic shops and had a cover price of $9.95. It is still available from The Independent Phantom Club of Australia. 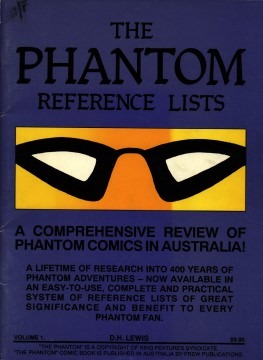 "What story appears in each issue"
"The A - Z of Story Titles"
Unfortunately this book was written at a time when Australian Phantom fans were relatively uninformed about Phantom story titles. Consequently, the story titles are "descriptive", eg. "Reporter Blake is inducted into the Jungle Patrol" instead of "The Reporter". It is still a very useful book for finding a particular story of interest. 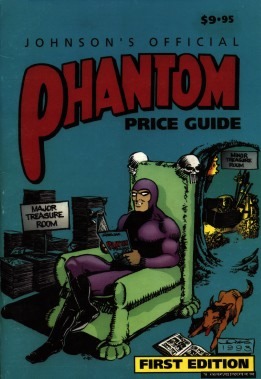 The Phantom Price Guide was compiled and published by Nigel Johnson, proprietor of Comics Etc in Brisbane, Queensland (he is no longer involved with Comics Etc). Two editions have been produced, each selling for $9.95. 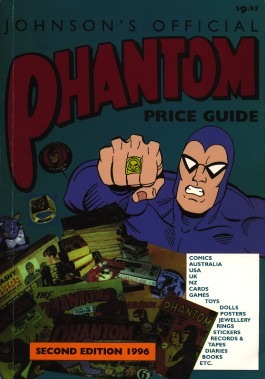 The first edition covered Phantom comics from Australia, USA, England and New Zealand. The second edition was extended to include trading cards, toys, games, dolls, posters, jewellery, rings, stickers, postcards, records, diaries ... and anything else King Features would care to license. These two volumes are responsible for single-handedly ruining the budgets of many Phantom fans. Once there was a time when it was possible to buy decent quality Frew back issues from secondhand bookstores. Now every one of those bookstore owners has this guide under the counter, and charges the inflated prices that are listed in it, often with little appreciation of condition ratings. Also, people who decide to offload their collections often mistakenly think that they will be able to sell their comics for the prices shown. Consequently, it is more difficult than ever for the GOOD comic dealers (like Comic Quest) to obtain stock, and the prices of old Frew Phantom comics are being driven through the roof! Incidentally, if you're only interested in getting one of the first two editions then I recommend you go for the 1st Edition. The print quality of the pictures in the 2nd Edition was woeful. The 2nd Edition can be purchased from Comic Etc. 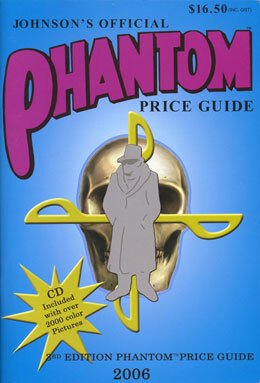 A third edition of the Price Guide was published in 2006. This was the first up-to-date edition since 1996, and it included a CD with over 2000 colour pictures. The Guide was priced at Aus$16.50 and is available from many comic dealers. A signed copy can be purchased directly from the author's website for $20 including postage (within Australia). For more information, see the advertisement on page 3 of Frew #1458 or contact Nigel Johnson.